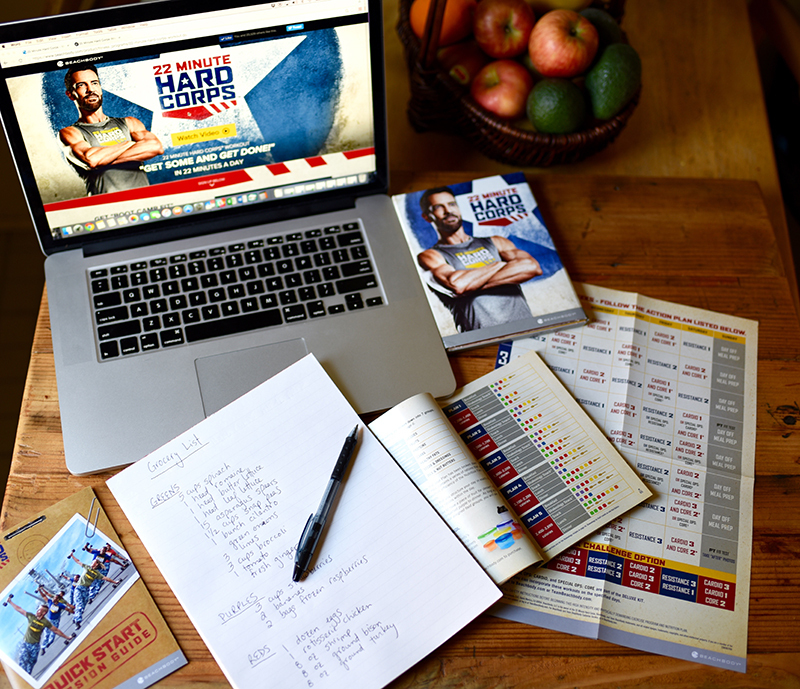 If you haven't yet committed to 22 Minute Hard Corps, you're missing out! This program is incredible, both for exercise and nutrition. 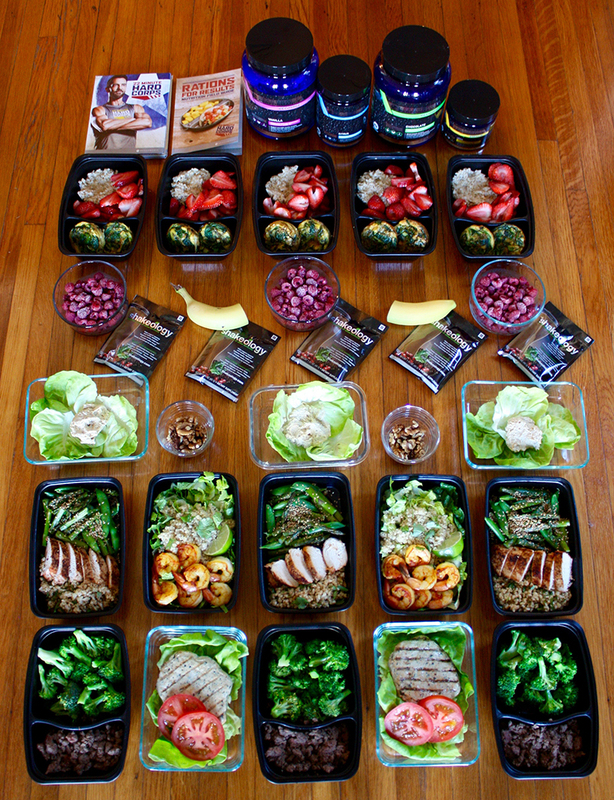 With this program, your mission is to work out hard and eat right, so you can enjoy those results. You can use this advanced food preparedness guide to prep your meals for the week with this program or any other. But, if you're on a time crunch and have little to no time to workout, this is a great choice because the workouts are only 22 minutes. The meal plan is a 1200-1500 calorie range plan so, if you are male, you would have to add an extra meal and snack to this. 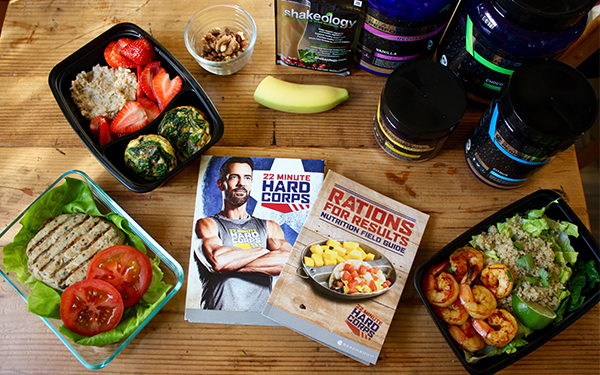 Daily rations in this 22 Minute Hard Corps meal plan include three square meals and two snacks. 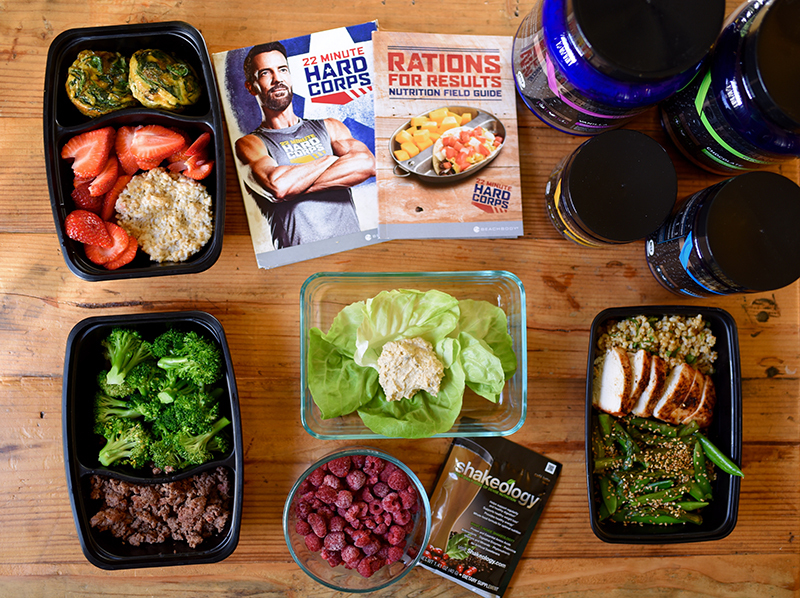 You’ll notice that this meal plan also includes Shakeology and Beachbody Performance supplements to help you achieve maximum results. Here are the meals you’ll eat on Tuesday and Thursday. 1. Deploying the right equipment will make this advanced meal preparedness more efficient. A rice cooker will make quick work of cooking the brown rice, quinoa, and if your cooker has a “porridge” setting, even the steel cut oats. If you do not have a rice cooker, all of these foods can be cooked on a stovetop. 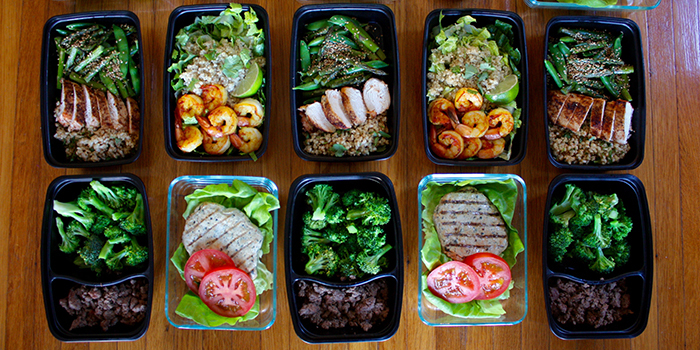 Start your meal prep by cooking ¾ cup brown rice in 1½ cups water, then set the rice aside to cool. Next, cook ⅓ cup quinoa in ⅔ cup water and then set aside to cool. Finally, cook 1 cup steel cut oats in 3½ cups water. Divide cooked oats evenly between five food containers, placing about ½ cup oatmeal in each. Set aside to cool. 2. While grains cook, bring a pot of water to boil. Fill a large bowl with water and ice. Place a steaming basket over the boiling water and steam 3 cups chopped broccoli for 2–3 minutes, then plunge broccoli into the icy water (this stops the cooking process and assures that your broccoli will be bright green when you eat it). Use a slotted spoon to remove broccoli from the ice water and set the broccoli aside. Using the same boiling water, steam 1½ cups snap peas. Plunge snap peas into ice water, then remove them with a slotted spoon and set aside. 3. Heat oven to 375° F. Coat a baking sheet with nonstick spray. Wash the asparagus, then chop about 2 inches off the ends and discard ends. Place asparagus on the baking sheet, season with salt and pepper if desired, then roast in the oven for 10–15 minutes or until tender. Leave oven on. 4. Heat a large pan over medium heat. Spray with nonstick cooking spray. Add 5 cups spinach, stirring frequently until spinach is wilted, about 3 minutes. Crack 10 eggs into a large bowl and whisk the eggs until the yolks and whites are combined. Add the spinach to the eggs and season with salt and pepper if desired. Spray a muffin tin with nonstick spray. Divide egg and spinach mixture evenly between 10 of the muffin cups. Bake in the oven for about 20 minutes, or until eggs are set. Place on a wire rack to cool, then remove egg cups from muffin tin. Add two egg cups to each of the containers that have oatmeal. Top each container of oatmeal with 1 cup sliced strawberries (or wait until after you reheat the oatmeal to add strawberries). Cover containers and place in fridge. 5. Sprinkle the brown rice with ½ tsp. cumin, ½ tsp. chili powder, 3 Tbsp. sesame seeds, and as much chopped cilantro as you’d like, then stir to combine. Fill three food containers with ½ cup each of the rice mixture. Top with ¾ of a rotisserie chicken breast, 5 spears of asparagus, and ½ cup snap peas. Sprinkle vegetables with 1 Tbsp. sesame seeds. Cover containers and place in fridge. 7. Divide 8 oz. ground turkey half, and shape each half into a patty; season with salt and pepper or other spices if desired. Heat a pan over medium heat and spray with nonstick cooking spray. Cook patties for 3–4 minutes, then flip. Cook for an additional 3–4 minutes, or until patties are no longer pink in the center. Set patties aside to cool. 8. Using the same pan, cook 12 oz. ground bison (or sliced bison steak, or lean ground beef) in 3 tsp. coconut oil until no longer pink, about 6 minutes. Sprinkle bison with cayenne pepper, garlic powder, salt, and pepper if desired. Divide bison evenly between three food containers. Add 1 cup broccoli to each container, cover, and place in fridge. 9. Place cooled turkey patties in two food containers. Add two leaves of lettuce and two tomato slices to each container. Cover containers and place in the fridge. (Just before serving drizzle with 1 tsp. olive oil and balsamic vinegar). 10. Prepare three small containers with ¼ cup hummus and 2 large lettuce leaves. Count out 2 servings each of 8 pistachios, sprinkle nuts with cinnamon and cayenne.